Ten years after the financial crisis, with the bull market now the longest on record, "black swan" fund Universa Investments chief investment officer, Mark Spitznagel, spoke on Bloomberg TV and said that "we are going to continue to see deeper and deeper [crashes], simply by virtue of the fact that the degree of interventionism is larger and larger." In other words, trading for "the end of the world"... but not expecting it to come tomorrow. In fact, his advice to traders is simple: "you mustn’t fight the Fed. What you must try to do is sort of jiu-jitsu the Fed. You need to sort of use the Fed’s force against it." For most, yes: founded in 2007, Universa quickly rose to fame the very next year when it made huge profits in the crash of 2008. On the other hand, as the WSJ wryly notes, "being skeptical and making money on that view are two different things." Fellow financial crisis standout John Hussman, who predicted both the 2000 and 2008 bear markets, is convinced an even worse one is coming, yet his own fund has performed dismally since 2009, eroding its crisis gains and then some. This is where Universa stood out. 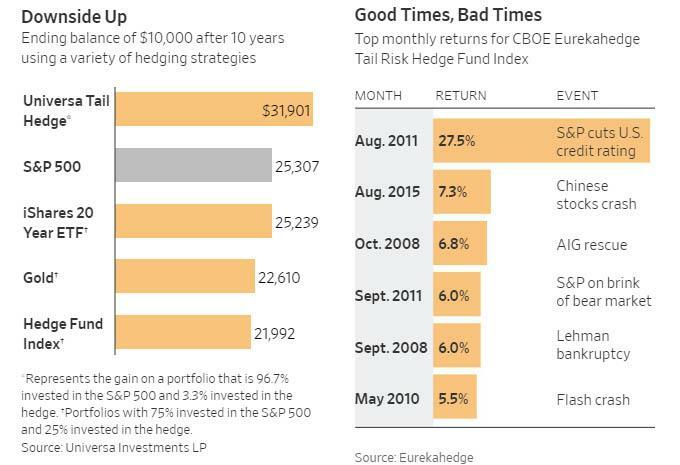 Unlike John Paulson, David Einhorn and Steve Eisman who made stellar returns during the crisis but have failed to repeat their success since, Spitznagel has enjoyed several mini-bonanzas along the way. During the ETFlash Crash of August 2015, his fund reportedly made a gain of about $1 billion, or 20%, in a single, unforgettable day. But was that performance repeatable, and could it beat the market in the long run... and certainly before the inevitable crash? To be sure, as the WSJ's Spencer Jakab writes, "talk is cheap in investing punditry and predicting a decline without saying when it will happen is cheapest of all." Yet Universa’s stance warrants attention, and not only because it backs its views with billions of dollars: Spitznagel isn’t betting on some unpredictable event causing a crisis but instead a predictable one—an eventual blowback from unprecedented central-bank stimulus. According to a letter sent to investors earlier this year and seen by the WSJ, a strategy consisting of just a 3.3% position in Universa with the rest invested passively in the S&P 500, had tripled the money, generating a compound annual return of 12.3% in the 10 years through February, better than investing in just the S&P 500 itself. It also was superior to portfolios three-quarters invested in stocks with a one-quarter weighting in more-traditional hedges such as Treasurys, gold or a basket of hedge funds. In our ten-year life-to-date, a 3.33% portfolio allocation of capital to Universa’s tail hedge has added 2.6% to the CAGR of an SPX portfolio (the SPX total CAGR over that period was 9.7%). To put this in perspective, this is the mathematical equivalent of that same 3.33% allocated to a ten-year annuity yielding about 76% per year. In contrast, each of the other risk mitigation strategies actually subtracted value over the same period, regardless of their allocation sizes. The 3.33% portfolio allocation size to Universa was chosen because it is (and has always been) the approximate effective allocation size recommended in practice at Universa (relative to a client’s total equity exposure). The 25% portfolio allocation size to the other risk mitigation strategies was chosen to be meaningful and realistic for an average investor (relative to their total equity exposure). That turned out to be insufficient for any of those strategies to provide a level of downside protection anywhere close to the level Universa provided. There is no magic to this outperformance: Spitznagel has traditionally buys put options, especially when they are cheap, like now for example, when despite bubbling trade wars, Donald Trump’s legal peril and sputtering emerging markets, have failed to dent the market's ascent to new all time highs. By pointedly ignoring headlines and embracing long stretches when his fund loses small sums for months on end, he draws on similar patience and conviction. As shown in the chart above, Spitznagel's small crash bets have paid off repeatedly, offsetting the "theta bleed" associated with a portfolio such as his. Which may also explain why Spitznagel is so happy: it isn’t because he sees an imminent crash, though he doesn’t rule it out. It is because almost no one else is preparing for one. Another quirk: in 2017, when volatility dropped to all time lows, buying crash insurance was seen by many as throwing away money. But Spitznagel said he was “like a kid in a candy store” because volatility, and hence options prices, were so subdued. At least they were until February of this year, when the VIX underwent a record explosion, soaring from the single digits to an all time high handing Universa's clients another outsized return with a true market hedge. Just sitting out the market in the long run is costly, which is why optimists triumph. Universa’s typical client suspects that the end may be nigh but wants to stay fully invested anyway. The occasional windfall, such as the one in 2015, is icing on the cake. Ultimately, the math behind Spitznagel’s investing philosophy is a simple bet on human nature: investors are "more confident after a long stretch of smooth sailing and hefty gains for markets, that is when the odds of something going horribly wrong are highest." And with the S&P at all time highs, Spitznagel has to be delighted: after all, both investor confidence, and the odds of that "horribly wrong" moment are just as high. "This is a very good time for us," he said. Now all he needs is a crash. A copy of Universa's decennial letter is below.